The kitchen remodeling process might take longer than you expect, so once you start a kitchen remodel, keep these four things in mind. The kitchen is the hub of your home – even if you have a designated family room for everyone to congregate, the kitchen is still going to be where everyone wants to go. But what happens when you want a remodeled kitchen? 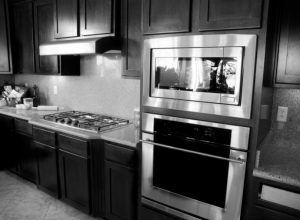 The kitchen remodeling process might take longer than you expect, so once you start a kitchen remodel, keep these four things in mind. First of all, consider the turn-around time for your kitchen remodeling project. How long will the whole process take? Whether you’re changing the look of your kitchen, having your laundry room redone, or getting your basement finished, any changes around the house are going to get in the way of your family’s usual routine. Once you’re in the thick of it, the kitchen remodel of your dreams might just seem imaginary. But the important part is to resist the urge to rush completion of the process. Stick with what will make you happiest – even if the new cabinets you want are out of stock, it’s better to wait for them than settle for a different set that may not be what you want, even if the other cabinets are available immediately. Getting the best value on your kitchen remodel is an essential part of remaining happy with the outcome of your new kitchen design. After all, cost overruns can lead to stressing out about your budget. But as we indicated in the above section, if you decide on a lower quality option just to save time and money, you could be inviting future unhappiness with your results. So if you allow a larger budget for your kitchen remodel, you can get your money’s worth. You should also consider how often you’ll be throwing parties or hosting other special occasions in your upgraded kitchen. Chances are, even with the winter holidays on the horizon, you won’t be hosting large-scale events in your kitchen for a few more months. If it’s a big birthday bash coming up that you have in mind, you might want to incorporate as much extra space into the design of your kitchen remodel as you can. Never forget that form follows function. As beautiful as your newly remodeled kitchen is, you should also make sure it’s easy to use and more comfortable to move around in; take into account how much time you plan on cooking in your new kitchen, and that should help guide your final decision. Whether you need a beautiful bathroom remodel, a kitchen remodel, or a home remodel, the experts at Kitchen and Bath Depot are here to help with all of your design and building needs. We provide remodeling services for our valued customers throughout the Maryland and Washington, D.C. area. If you are ready for a quote and to see how we are different than other companies, contact us or give us a call at (301) 888-5324. For more tips, follow us on Facebook, Twitter, Google+, and Pinterest. This entry was posted on Friday, October 6th, 2017 at 4:28 pm. Both comments and pings are currently closed.